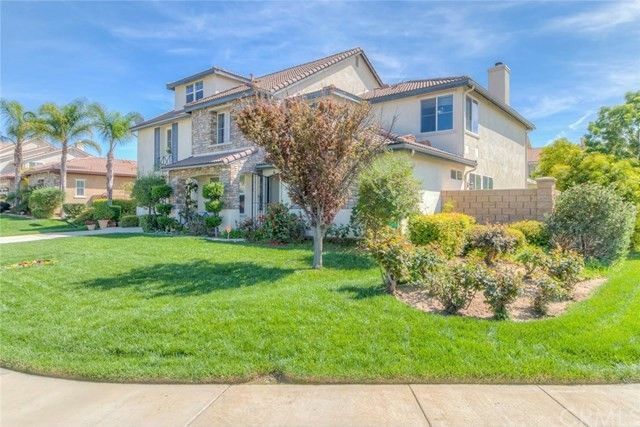 Stunning Pool Home in highly sought after Mission Hills development in the Orangecrest community of Riverside. This home has everything your heart desires, tall ceilings, double door entry, front porch, 4 car tandem garage, Tile traffic areas, dramatic chandeliers, Open floor plan with maids quarters downstairs, Sitting room overlooking front yard, Formal Dining room with open wall to the huge family room. Kitchen has all the upgrades, granite, island, pantry and dozens of cabinets! Master bedroom is a suite with Fireplace, Walking closets and 5 star master bath! Champagne tub, dramatic shower, bright and airy. 2nd floor Laundry, jack and jill baths, bedroom with private bath, Huge Laundry room on 2nd floor, game room with surround sound on 3rd floor! Beazer quality built home. Bedrooms have mirrored closet doors, large closets and window coverings! Back yard is like a hotel, covered 'alumnawood' patio cover with ceiling fans. Large custom pool and heated spa. 2 separate deck areas and a sitting area in on west side of home. Nothing has been overlooked in this home. It will impress most any family and the schools and neighborhood just don't get much better. Working irrigation lines front and back, Mature landscaping, this home will impress the best! Great for Multi-generational or Multi-Family Buyers. Directions: From Krameria go south on Estrella Hills to corner of Country Rose.